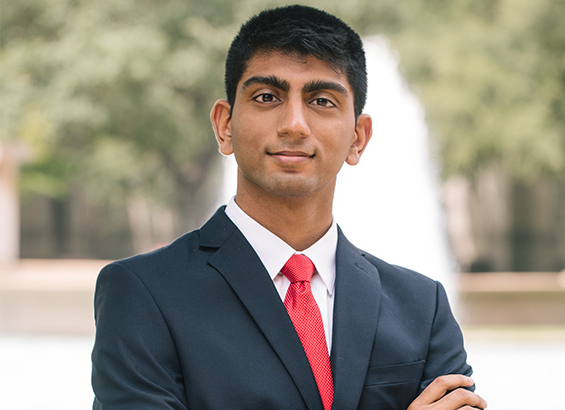 Neelesh Mutyala, a junior who majors in honors biomedical sciences with a minor in education, will start his one-year term as student regent with the UH System Board of Regents on June 1. If you see University of Houston student Neelesh Mutyala on campus, go up to him, say hi and introduce yourself. This is one way Mutyala, who goes by the nickname Neel, wants to begin his relationship with the UH System community as he takes on the role of new student regent for the UH System Board of Regents. On Thursday, June 1, the Sugar Land junior, who majors in honors biomedical sciences with a minor in education, will be the 12th student regent to serve on the UHS Board. Mutyala, 20, will be the youngest to date and the first from the UH College of Natural Sciences and Mathematics. When he is not studying or working at his family business, Mutyala heads up the Ben Taub Critical Care Initiative, a program that gives biomedical students the opportunity to volunteer at the Medical Intensive Care Unit at Ben Taub Hospital. He relaxes by heading to the range with the Houston Archery Club or throwing his line in the water with the Interscholastic Fishing League, two UH student organizations. What would you like to do for a career? My first goal is to be a physician and serve in one of the reserve branches of the armed forces. Down the line, I would like to be a professor of medicine. My minor in education has taught me to really love and appreciate the art of teaching. What is your proudest moment as a UH student? Being able to attend the UH-University of Oklahoma 2016 season opener at NRG Stadium. The moment that stood out to me was during the third quarter with 8:48 left on the clock when OU made a field goal attempt and missed. That’s when a UH player caught the ball and ran it back across the field for a kick-six. I’ve never felt such excitement and euphoria in the student section than at this game. What experience do you bring to the Board of Regents? I’ve done research internships at the Mayo Clinic, Rice University, Texas Heart Institute and the University of Texas M.D. Anderson Cancer Center that taught me about cardiology, bioengineering and improving the patient experience. All of those, while they may seem very different, have given me a good sense of interpreting data and doing things systematically. Regents look at a lot of data with regards to student performance, retention, auditing and compliance. I feel my research experience will be helpful in that area. What example would you like to set for your classmates? I want people to see that if you put in a lot of hard work and do your best that success will come. My hope is to get students what they want and to keep the board cognizant of the students’ needs, challenges and ideas. How are you going to hear what students are saying? It’s important for any student regent, regardless of what college he or she comes from, to be able to step out of the bubble and know what’s going on – not just at every college but the entire UH System. Part of my plan is to attend Student Government Association meetings and various organizations on campus. I really want to just talk with people. The Texas governor chooses a student regent every year. You have to admit, it’s a pretty great feeling to have been appointed by Governor Greg Abbott. When the governor appointed me as student regent, many people reached out to say “congratulations”. But honestly, I would like people to wait until the end of my term on May 31, 2018, see what I’ve done in this role and evaluate it for themselves before they say “congratulations”.